If you know me, you know I like to see at least one snow a year. Since we moved to SC, we don't get to see quite as much as we used to. Last Friday night they were calling for snow, sleet, and freezing rain where we live. The picture above shows what we got at our house. 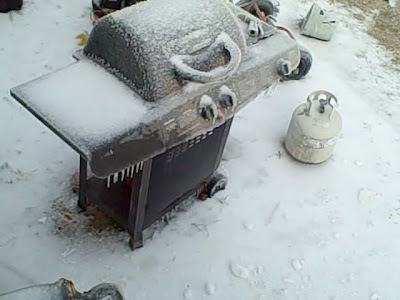 It was mostly freezing rain and sleet an inch or so. Where we used to live, they were only calling for snow. I kept thinking how much I'd love to really see some snow. So late Friday afternoon, I finally decided we should just go on up there. It's about a 2 hour drive, and about an hour after we left home it started snowing. There's just something special about riding in the snow. The roads started getting kind of bad the last 10 miles or so, but we drove slow, and made it fine. I know all you northerners out there make fun of us southern folks who stop everything when it snows. I think that's because it's so special down here since we don't get it much. 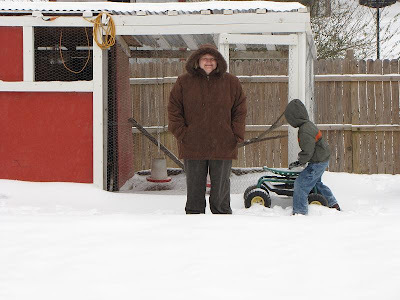 My friend, Barb, took the pictures of me and my son at her house playing in the snow. I'm so glad she let us come up there at the last minute to visit. 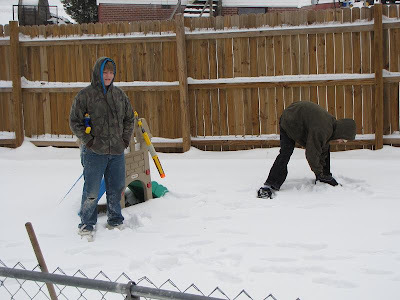 They ended up getting around 6 inches or so of snow. It was so beautiful! But, very, very cold! I didn't stay out too long. They are calling for a mix up there tomorrow and again on Tuesday. But, now that I've seen some snow, I'm good. I just want it to be dry for awhile! It's pouring down rain right now, so I guess I'll have to wait awhile for that to happen! I totally understand,we get snow sometimes and when we do we kind of stop everything too. All the schools seem to cancel for an inch of snow. Absurd, but I think the kid in us just kicks in and wants to stay home and play, or drink hot coco as we gaze outside to the winter beauty. 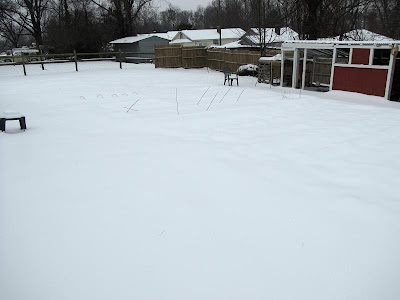 I am jealous of all the snow the rest of the U.S. is getting, we have rain, mud & mosquitoes...oh well, that is why it is so green around here, praise God! Hi Nancy, what a treat for all of you to get to enjoy the snow. It's very pretty and always exciting to drive while the snow is falling. We have had a LOT of rain for the past few days and more on the way for today. I'll be glad to see the sun again! Snow and a wonderful friend makes for a great weekend. Glad you decided to go and loved the pics. I love to watch snow falling....but that is about it!! I'm one of those southern girls who prefers the warm weather any day!! But definitely not snow or sleet! I am so glad that you got to see such a wonderland of snow! I wish we would get a little snow--I haven't even seen flurries here this year! Ummmmm...All we get in Greenville is a little snow and ICE!!! Well for once we didn't get any of the snow the rest of you got. I'm glad you got to see some snow this year. I'd be happy will one snow a year too. The puddles are shrinking over here. But if it keeps up like it has been, they won't get a chance to dry completely up. One GOOD snow per year is good for me, too. But we usually only get ice. I'm with you, Nancy! It's fun to get the snow and play in it....but now it can be dry again and Spring can come! Looks like you all had fun! Glad you got to enjoy some snow! Loved the pics! I'll send some your way! we got 12+ inches friday and saturday with a possibility of 12+ more inches tomorrow and wednesday. i love it - when I can stay inside and don't have to go anywhere - but I'm glad you had a good time in it! I'd be happy to ship you some snow!!! We've got plenty. The drifts have been up to 8 feet deep in our yard! Snow is so beautiful, yes, but I am soooo ready for spring! Brrrr... looks so cold- but so much fun! !